Water is essential for the survival of all living creatures, including your furry friend. 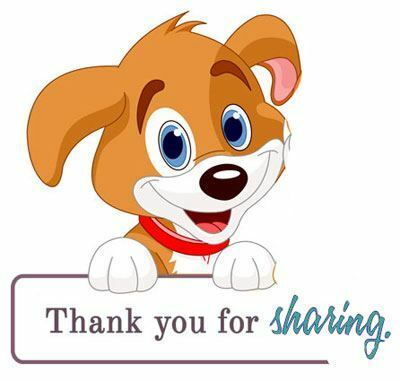 Dogs need a constant supply of clean drinking water to stay healthy. Not only does it keep them comfortable and refreshed, but water also plays a crucial role in vital organ function. Dogs need upwards of one fluid ounce of water per pound of body weight each and every day. Needless to say, it's important to keep the water flowing. While you can easily schedule your dog's meals and make them wait to get a snack, drinking water is another story. It's recommended that your dog always has access to water. If you're like most dog owners, you're not always home every time your dog empties their bowl. Water dispensers are a great option to ensure that your dog always has access to drinking water. They can store large amounts of water so that you don't have to worry about constant fill-ups. Some designs also help to improve water quality and avoid water-borne bacteria. Here are some of the best water dispensers that money can buy. 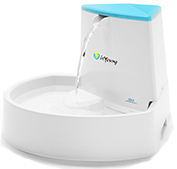 This sleek and stylish fountain from isYoung can keep your dog's water free of unwanted bacteria. It's made of durable plastic and features a large vertical pump housing. The pump is discrete and out of the way. The fountain is designed for easy cleaning. Simply open the housing cap to replace the filter or remove it completely to clean out the pump. The fountain creates a large stream. The stream is broken up by a small panel to reduce water noise. In total, this fountain can hold up to 88 ounces of water. 2. PetSafe Drinkwell Pagoda Ceramic Drinking Fountain for Dogs, 70 oz. 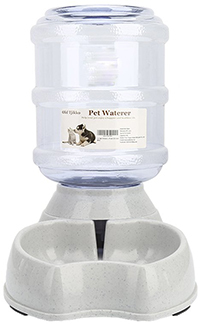 Another great option from PetSafe is the Drinkwell Pagoda Fountain. As its name implies, it's has a beautiful Asian-inspired look. The square shape of the bowl is complemented by the fountain column in the center. Because the fountain is in the center, the outer bowl can be accessed by multiple pets from all sides. The fountain is made of high-quality ceramic. It's also available in four different colors. These include white, taupe, red, and blue. The fountain is dishwasher safe as long as it's on the top shelf. It can hold up to 70 ounces and uses a carbon filter. With a large reservoir that can hold about a gallon of water, this dispenser is great for giving your dog all the water they need. It features a large and sturdy base made of high-quality plastic. The plastic is BPA-free, food-grade, and incredibly durable. There's also rubber on the bottom to prevent the base from sliding around on smooth floors. The reservoir features a spring valve system. It prevents leaks and allows you to attach the reservoir to the base without any messes. 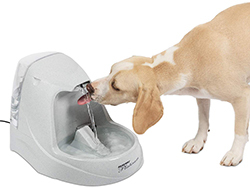 This water fountain from PetSafe can keep multiple dogs hydrated throughout the day. It has a maximum capacity of two gallons. The large bowl is made of BPA-plastic. The bowl is square and features hand grips on both sides for easy moving. On the back rim of the bowl, you'll find a large fountain tower. It has a customizable water flow cap and two different filters. The large foam filter catches debris before it gets to the pump while the charcoal filter takes out impurities. The Fountain comes apart easily to make cleaning a breeze. Do you want a simple dispenser that you can take with you on the go? 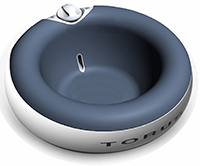 Take a look at the Torus water bowl. It has a unique design that keeps water hidden until its time to take a drink. The water is held in the wide rim of the bowl. A small knob on the top of the bowl can be removed for filling. It also features a small carbon filter to purify water as it comes out. When your dog gets thirsty, simply turn the knob. Water will flow out of a small hole to fill the bowl. The water level stays quite low to prevent messes. When you're ready to go, simply turn the knob to the lock position to prevent leaks. It holds half a gallon of water and is available in seven colors. 6. PetSafe Drinkwell Platinum Water Fountain, Built-in Reservoir w/ Filtered Water for Your Pet, 168 oz. The Drinkwell Platinum from PetSafe is easy to use and clean. The fountain is molded to create one cohesive shape with a bowl and pump housing. While it looks like one piece, the various pieces can be removed for cleaning. It features a charcoal filter, adjustable flow cap, and long power cord. On the back, you'll find a large reservoir that can hold up to 168 ounces of water. The reservoir can be popped out for easy fill-ups. The entire unit is made up of BPA-plastic. The bowl and tower feature a stone-like finish that looks great in any room. 7. PetSafe Drinkwell 360 Multi-Pet Stainless Steel Dog Fountain, Filtered Water, 128 oz. 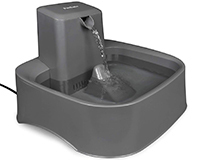 PetSafe is one of the most trusted manufacturers for dispensers and fountains. The 360 fountain is a great option if you have multiple dogs that need to stay rehydrated. The unique design makes it accessible from all sides. 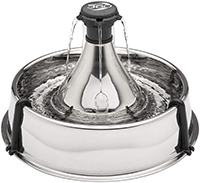 It features a durable stainless steel bowl and a fountain. The fountain utilizes a steel cone to disrupt the water flow and minimize noise. The fountain comes with five different fountain heads. You can have a single stream or up to five. Furthermore, you can customize how much water comes out with a flow cap. The fountain has a charcoal carbon filter and is capable of holding up to 128 fluid ounces of water. Not all dog water dispensers are made the same. The market is flooded with a number of different designs to suit you and your dog's needs. Gravity-based water dispensers are some of the most prevalent among dog owners. They're simple, easy to use, and can provide your pooch with days of drinking water. These types of dispensers work on a very simple design principle. They feature a large water reservoir that's connected to a bowl. When you place the reservoir onto the bowl, the water flows into the bowl to fill it up. Once the water level in the bowl reaches the opening of the reservoir, the flow stops. The low air pressure in the reservoir prevents the bowl from overflowing. You won't have to worry about a thing. The only thing you'll need to pay attention to is the water level in the reservoir. It will constantly fill up as your dog takes a drink. These dispensers come in a wide variety of materials, sizes, and capacities, allowing you to get the right one for your dog. If you want something a bit more pleasing to the eyes, you can get an electric water fountain. Fountains contain a small pump that's hidden away from view. The pump keeps the water moving. Depending on the particular design, it may create a small stream of water or a waterfall. The constantly moving water is great for a number of reasons. First, it can help keep the water fresh. Stagnant water can quickly become a breeding ground for bacteria and insects. By keeping things moving, you can prevent possible health issues. Secondly, the sound is great for teaching your pup where to drink. While most dogs will eventually find their bowl without a problem, older canines or those with vision problems may find it more difficult. The sound of flowing water will draw your dog near and let them know its safe to drink. Many fountains also come with the addition of a filtration system. The pump pushes the water through the filter to catch hair, debris, and much more. Some even take out dissolved contaminants. You can also easily find fountains with a large reservoir so that you don't have to fill the device constantly. The main downside to electric fountains is that they always need to be near an outlet. You'll also have to make sure that your dog doesn't chew the cord. If your pup spends most of their day outside, an outdoor dispenser may be for you. Outdoor dispensers can be attached to a water hose for easy filling. Typically, they have a built-in float valve that regulates water levels. Once it reaches the designated threshold, the valve will prevent any more water from getting into the bowl. This prevents overflowing and makes sure that your dog's bowl is always filled. No long hike or road trip is complete without a portable water dispenser. These products work very similarly to gravity-based dispensers. They use the same methods and design principles. However, everything is scaled down to make transportation a breeze. Instead of a large reservoir, these dispensers allow you to attach a bottle of drinking water. They often include a foldable bowl that fits nicely around the bottle when your dog is not taking a sip. When your pup gets thirsty, simply fold the bowl down, place it on the ground, and let gravity do all the work. Now that you know what type of dispenser or fountain you will need, you can get down to the details. There's a lot to consider when you're choosing the right product. Small details can make a dispenser more difficult to use. Keep the following information in mind to find the right option for you. Before you look at anything else, you need to make sure that the bowl matches your dog's size. A tiny Chihuahua-sized bowl is not going to be very effective if you have a Saint Bernard! A good way to find a bowl that's perfect for your pet is to go with a size that matches their food bowl. Your pup will need plenty of room to lap the water up. Additionally, you may want to consider the depth of the bowl. Some dogs like to dunk their entire muzzles into the water while they are drinking. Others don't need that much room. The size and depth of the bowl will also affect the cleanliness of your dog's drinking area. If Fido is a messy drinker, you may want to find a bowl that's a bit bigger and deeper to keep stray water droplets contained. One of the biggest benefits of a water dispenser is that you don't have to constantly provide water. When you're looking for a dispenser or fountain, find a product with a large reservoir that works with your filling schedule. Reservoirs can provide enough water for the entire day while others can last your dog for many weeks. Typically, medium and large-sized dogs can do well with a reservoir that's around 60 or 70 ounces in size. With this capacity, you would only have to fill up the reservoir once a day. 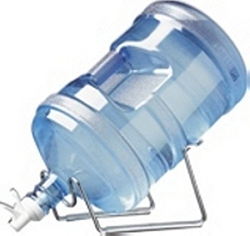 If you want even more time between refilling, go with a dispenser that can hold a couple gallons of water. There are three main materials used in dog dishes. They all have their own advantages and disadvantages. The cheapest option is plastic. Plastic is good for well-behaved dogs that won't chew on it. The low manufacturing costs of plastic make these types of dispensers very affordable. If you go with plastic, make sure that it's free of BPA and other harmful chemicals. One thing to remember about plastic dispensers is that they have a much shorter lifespan. Not only are they easier to damage, but the material will degrade over time. Furthermore, any chemicals in the plastic can dissolve into the water, leading to dry noses and allergic reactions. Stainless steel options are also available. Stainless steel is often the go-to option for experienced dog owners because of its resilience. The material doesn't contain any harsh chemicals and won't rust over time. Bowls made out of steel are also easier to clean and maintain. The main downside is that they tend to cost a bit more. Luckily, with proper care, steel dispensers can last throughout your dog's life. Another durable alternative is ceramic. Ceramic products are very durable and can be designed with a distinct style. Ceramic isn't as tough or easy to clean as steel. However, one of the biggest advantages of the material is its weight. If you have a rambunctious pup that can't keep still while they're drinking, ceramic may be for you. If you want to make sure that your canine companion is getting the very best water possible, you can get a fountain with a purification system. Most electric fountains have some type of filtration system that's designed to remove contaminants and particles. They keep the water fresh and remove any unwanted smells or tastes. There are a couple of basic types of filtration systems available. The first is a foam filter. Fountains with this system usually have a thin piece of foam that's designed to catch stray hairs and food particles. The second option is activated charcoal. Charcoal carbon filter pads remove volatile organic compounds, dissolved sediment, and even chlorine. Regardless of the type of filter you choose to go with, it's important to remember that the filter will be a recurring cost. Most filters have to be replaced every three months or so. Before you choose a fountain, check to see what type of filter is used and whether or not it's readily available. Luckily, most replacement filters only cost a few dollars and can be purchased directly from the manufacturer. While filtration systems can do wonders for your dog's overall health, they do have one downside. They can't be used with water additives. Water additives are a great way to keep your dog's breath fresh. Unfortunately, the purification process will filter the additives out a few moments after you add it to the water. Last, but certainly not least, is maintenance. Regular maintenance is important when you own a water dispenser. If you don't take care of the product, it can easily become disgusting and unsanitary. Before you choose a dispenser, you may want to think about how easy it will be to clean. Gravity-based dispensers only have two parts to wash out. However, if you own a fountain, you'll need to clean out the filter and various pump parts. Oftentimes, fountains also require disassembly for cleaning. If you want to make your job a bit easier, you can also look for dispensers or fountains that have dishwasher-safe parts. Usually, steel and ceramic components can be popped into the dishwasher without any issues. * Cheaper plastics may melt or become warped. Always check the instructions beforehand to make sure. Whether you choose to go with a simple gravity-based dispenser or a fancy stainless steel fountain, your dog will appreciate the fact that they can always take a sip of water. High-quality dispensers will keep your dog' drinking supply safe and may even get your dog to start drinking more. You can rest easy knowing that your dog is hydrated, healthy, and comfortable.